Del Sur, The Coastal Hills of North County Blending Environmental Commitment with Architectural Excellence. Tucked up in the coastal hills of north county, yet close enough to the Pacific to feel the ocean breeze is the innovative, eco-friendly, and master-planned community of Del Sur. Located just 30 minutes from Downtown San Diego and seven miles from the coast, Del Sur was designed around the concept of “neighborhood”. The renowned homebuilders of Del Sur found inspiration by walking the streets of San Diego’s historic communities, including Mission Hills, Coronado, Kensington, and Rancho Santa Fe. This inspiration led to intimate neighborhoods with mature trees, native landscaping, and beautiful green homes of varied architecture. 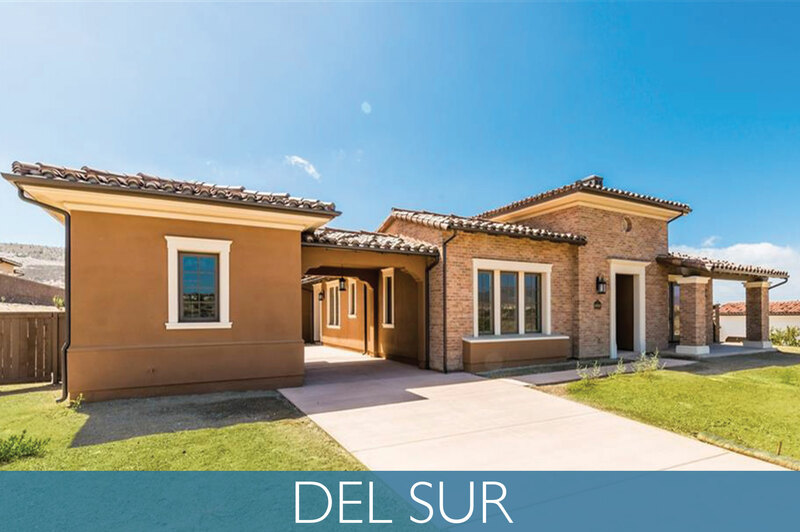 The commitment to conservation and fine craftsmanship set the homes of Del Sur apart from every other new home community of today. View more about Del Sur on Pinterest! Conservation is a way of life in Del Sur and these efforts are not only seen throughout the community, but each resident contributes with green features in every home including low toxin paints and glues, low emission windows, Energy Star Appliances, solar energy, and water conservation. Homeowners using solar power will collectively save more than $58,000 annually in electrical bills, which also translates into saving 35,000 barrels of oil. The various neighborhoods within the Del Sur community are listed below. Furthermore, each neighborhood boasts a uniquely designed park with pool within walking distance. Each pool features solar panels, keeping them heated for the residents to enjoy year around. There are also 1,000 acres of preserved open space with 18 miles of trails for the residents to enjoy. Mandoline - Luxury attached homes with garages, mountain views, and luxury amenities. Bridgewalk - Spanish Colonial, Italian Revival, and Monterey architectural style single family homes with luxury amenities. Madeira - California Bungalow, Spanish Colonial, Rustic Cottage, and Mediterranean Farmhouse style single family homes with luxury amenities. Pasado - Monterey, Cottage, Spanish, and Bungalow style single family homes with wraparound porches and luxury amenities. Carleton - Traditional San Diego style single family homes with luxury amenities. Valencia - Mediterranean style single family homes with outdoor rooms and luxury amenities. Presidio - Spanish, Italian, and Mediterranean style homes with luxury amenities. Sentinels - Rustic European village style homes with courtyards and luxury amenities. Haaland Glen Park - Featuring rock wall amphitheater, lawn, and swimming pool. Reagan Glen Park - Large pear orchard, trellis, and swimming pool. Mel Driscoll Memorial Park - Large, colorful playground, and swimming pool. Spreckels Park - Like Presidio Park in Mission Hills. Central gathering place for community. Expansive lawns, terraced gardens with seating, and central plaza featuring giant sundial. Kristen Glen Park - Stone and grass labyrinth, fireplace, and lap pool. Old Stonefield Park - Enclosed play area with swings, swimming pool, and dog park. Beltaire Park - Bocce ball court, olive grove with handmade tile markers, and artisan-crafted scoreboard. High Rose Park - Mini racetrack for tricycles and access to the regional trail system for hikers and bikers. The newer community of Del Sur is located within the prestigious Poway Unified School District, which is one of the highest ranking districts in the county and state. The teachers were actually handpicked from the best of Poway schools for this $110 million state-of-the-art facility. There are also many after school enrichment programs offered for children of all ages in Del Sur.